For a long time, I was on the fence about entering either the KBF Open or KBF Invitational. It meant taking a couple days off of work, battling guys with way more knowledge of the lakes than myself and being away from Mary May and the dogs. But in the end, it seemed like too much fun to pass up. So, last Tuesday afternoon I packed up and headed to the Santee Cooper Lakes in central South Carolina. It was a roller coaster of a week for me and although not an unsuccessful tale, it was certainly a "what might have been" experience. I spent evenings the week before the tournament scouring over lake maps and aerial photography. I also elicited the advice of friends Bill Kohls and Will Petty. As mentioned previously on this blog, Bill and I often break down lakes in very similar ways and regularly talk fishing strategy. I met Will, a very talented angler form the Charlotte area, through Bill back in 2011. Will had fished Santee Cooper a few times before and was able to give me a lot of good advice going in to the event. For those of you not familiar with Santee Cooper - it is made up of two huge lakes. The upper lake is Lake Marion and the lower lake, connected by a diversion canal, is Lake Moultire. After lengthy discussion, I decided to start fishing a creek on the south side of Lake Marion. I got to Lake Marion around 1:30 PM on Tuesday. I was on the water by 1:45 and headed out to explore a long set of deep docks I saw on the map. The ends of said docks dropped into 10-15 feet of water, which is quite deep for these lakes. It looked like a perfect area for fish to stage as they moved back the creek to spawn. I fished them hard, but only managed one small bass which ate a 4" Berkeley Power Tube. I talked to a few other bass boats in that area and most of them were finding the bite slow as well. So, I decided to paddle out toward the mouth of the creek in hopes of finding some fish. I fished another hour without a bite and was beginning to wonder if all my game planning had went terribly wrong. About that time I ran into a group of kayak anglers from Florida who had been in the creek arm all morning. They too had been skunked. I spoke with them for a few minutes, but was determined not to give up on the area. I paddled to the backside of an island that looked promising. As is much of the lake, it was littered with cypress trees and mixed grass. It looked too good to not hold fish, but still I was without a bite. Finally, at 4:15 PM, I got my first sign of life. I flipped a finesse worm to a big cypress tree located on a point situated off a funnel area. I felt a bite, set the hook and immediately the fish began pulling drag. I knew it was a solid fish as it bulldogged me toward deeper water. After a good fight, I landed the brute - a 21.5" fish that was in the 5.5 lb class. The biggest fish I landed from Santee Cooper at 21.5"
At this point a light bulb went off in my head and I realized I was wasting a lot of time casting to trees that weren't holding fish. So, I paddled up to the next tree that looked like it fit the pattern, tossed in my finesse worm and BAM - fish on! This fish again pulled drag like it was nothing and had a stomach that looked like it was about to burst. The 19.5" fish weighed around 4.5 lbs. Santee Cooper was growing on me. I didn't want to sore mouth all of my fish before the tournament, so I made just 3 more casts. The last of the three happened to hook my third fish of the day - a 3.5 lber that measured at 18.5". I then just cruised around marking trees, drops and grass beds until about 5:30 PM. At that point I packed up and headed for camp to game plan for my second day of practice. I talked with some fellow anglers who had mixed success. In talking with them, I realized that I was fishing a different pattern than most of them - targeting colder, dirtier water. So I decided to try a different creek arm on my second day of practice. This particular creek was situated right off of the main river channel and had a mix of trees and side channels that looked perfect. The next day I launched around 7:15 AM. I paddled about 15 minutes to my starting area and within 5 casts was hooked up on a nice fish. He ran drag like those before him and tried to wrap me around a cypress knee. Thankfully, my Carolina Custom Rod was up to the task and bullied him to the boat. It was a 20.5" bass - my cold water gamble was working. After releasing the fish, I scouted a shallow, reedy area with no luck. I then went back to deeper water hoping to replicate my pattern once or twice again. This area didn't have many prime targets, so it made for a lot of paddling between casts. Finally, I found an extremely fishy looking spot and had a fish smoke a jerkbait. It was another good fish, measuring a fat 18.5"....and it was 8:30 AM. I realized that in about 5 hours of fishing a lake I knew nearly nothing about, I had managed a 5 fish limit of about 22.5 lbs. I was feeling confident so I marked a few more spots and then paddled back to the ramp to avoid the brutal winds that were forecasted to roll in that afternoon. The rest of the day I caught up on work, napped, prepped gear, did a little more map study and eventually headed down to Blacks Fish Camp for the captains meeting. KBF head honcho Chad Hoover went over the rules and details of the event and there was a definite buzz in the air. There were 131 anglers entered and eager to show their fishing skills. I got to see a lot of familiar faces and meet a bunch of new friends too. I didn't stay too terribly long and headed back to camp to get some sleep before the big day. Official launch time was 6:30 AM with first cast at 7:00 AM. I arrived to find an empty launch around 6:15 AM. The air temp was 34 degrees and the water temp had dropped nearly 10 degrees overnight. That sort of cold front can kill a bite. My mind was racing and to top things off, 6-7 other kayakers rolled up around 6:30. I knew it would be about execution and focus. I scarfed down some jelly beans (eating candy is a pre-launch tournament tradition of mine), absorbed some caffeine via a Coke and around 7 AM I made a long paddle to my main area and started working a trick worm very slowly. I hit my first few trees with absolutely nothing to show. I then went to an area I had marked on the map, tossed a cast to the base of a big cypress tree and saw my line immediately swim sideways. I set the hook and knew it was a big fish. Unfortunately, my drag must have been knocked around in the car because it was lighter than I typically set it and I never got a good hook set. I continued to fight the fish on light drag until I caught a glimpse of the brute. I decided to try and tighten up the drag and re-set the hook. The plan almost worked, but as I tried to tweak the drag the fish came right at the boat and when I put pressure on the hook it popped right out. I dropped an f-bomb that was probably heard on the lower lake. The fish was in the 21"-23" range - a heartbreaker. A fish like that at 7:45 AM is a game changer, but I had to shake it off and keep fishing. I continued fishing that area with only one other bite - a fish that bit very lightly and stole my worm. It was around 10 AM and I was fishless. It was time to make a run to my other area and try to get a couple quick fish on the board. I paddled back to the car, packed my gear, loaded the yak and was headed 10 minutes down the road. I launched at warp speed only to find that the wind was just blasting my area. I was paddling through near white caps and rolling over some serious waves, but the MK Stealth 12 handled it like a champ. The areas I had caught fish in or marked the day before were totally out of the question because of the wind, but there was one area that looked perfect. It was an ideal place for fish to tuck in out of the wind and river channel for a quick rest and snack. Sure enough, on the first cast I hooked a fish that felt more like a freight train. We fought each other with all the might we could muster and when he finally hit the bottom of my net I had the utmost respect for him. The bass measured 19" and was probably in the 4.5 lb range. I was on the board and feeling good. I briefly fished around the area before paddling back to the launch, re-loading and heading back to the creek I had started in. Some anglers were leaving as I was pulling in - never a good sign. I ran to my best area - nothing. Then my second area - still nothing. My pattern had changed slightly. I began throwing a variety of baits hoping to get some sort of reaction bite, but was having no luck. Finally, around 1 PM, I made an adjustment and immediately caught a 17.5". I quickly followed with a 17", 15.5" and 15" fish to end the day. It was a two fish limit, so I went to the weigh-in with 36.5". After the judges surveyed all of the photos, I was only a couple inches off of the lead for Day 1. The best stringer was 40" followed by 39" and 38.5". The big bass was 21.5" (although there was a 22" bass caught and photographed without the required identifier). I was told my total put me somewhere in the 6-10 range. What I didn't know was that on day 1 we were fishing to simply make the cut into Day 2. On Day 2, we were all re-zeroed and it was like an entirely new tournament. Since there were about 40 skunks, the cut was simply catching one fish. I knew my spots were all recharge spots, meaning that fish would cycle in and out of them throughout the day, but I was still a little bummed about the zeroing process. Regardless, I liked my pattern and was eager to start day 2. The plan for day 2 was to start in my secondary area, try for two really quick bites and then chase big fish shallow the rest of the day since I expected the warm weather would move a few big fish up in the afternoon. I got to the launch at 6:45 AM knowing that I needed some sun for my areas to produce. While getting ready, I realized that I was out of jelly beans and other Easter candies - never a good omen for tourney day! I decided to wait until 7 AM to launch because there was a public park that opened at 7 AM and launching in it would cut about 15-20 minutes off of my paddle. Well 7 o'clock came and went without a sign of a park attendant to open the gate. When 7:15 came and I called the number on the sign. The guy who answered seemed surprised it wasn't open yet and assured me that at any moment the attendant would be there to open it. 7:30 AM came and I decided I was done waiting around, launched from the cement launch, paddled an extra 15 minutes and grumpily started fishing. I worked my way down a line of trees without a nibble. Eventually I came to the tree where I had caught the 19" fish the day before. I felt a bite, slowly lifted my rod and felt the line hang up on a stick. It was a risky situation - set the hook and possibly have it shoot sideways and out of the fishes mouth or don't set it and hope that it somehow becomes lodged. I chose to set the hook. For a second, drag peeled and then nothing. The hook popped free. I am not sure how big the fish was, but it definitely would have helped me. I paddled to a creek arm adjacent to where I had been fishing. It was an area that looked great on the map, but was impossible to get to with the high winds of Wednesday and Thursday. I fished the area hard - really hard. Finally, I got a bite and landed a 17" buck bass. I knew I would need to upgrade before the day was done, but it was a start. I fished that area a while longer without another bite. So I paddled back to the park and beached my boat. It was nearly 10 AM, so I figured the park would surely be open. The plan was to jog about 1/4 mile back to the car, drive the car down into the park and load up there rather than fighting the wind for 15+ minutes around a long point. I ran to the car as quickly as I could, but as I emerged from a wooded area, I noticed that the gate was still closed. Insert day 2 f-bomb here. I ran the 1/4 mile back to the yak and was about to drag it the 30 yards back to the water when I spotted a sandy jogging path. I grabbed the tow rope and headed for the path. Let's just say that pulling a fully loaded yak some 150+ yards down a sandy path is not a fun tournament day task. But I eventually made it to the gate and across a small grass patch to where I had parked. Although my legs were on fire, the drag saved me a good 10 minutes or more. For a moment I contemplated the letter I would be writing the city park and rec department, but I was too motivated to be angry and headed to an area that I hadn't pre-fished at all, but looked perfect on the map for big fish moving up to spawn. Long story short, that area looked great in person as well. In fact, I found one secluded pond that looked downright amazing. But I couldn't buy a bite and the last thing I wanted was to come in with only one fish. In all, I wasted about 4 hours chasing a big fish that never materialized. I headed back to my main area for one last hurrah before I had to get to the weigh-in. I launched, made a short paddle and on my first cast hooked a 17.25" bass that completed my limit. I knew I needed a 20"+ fish and I knew my time was running out. I fished super hard until 2 PM and managed only one more fish - a 17" bass that kept my string of mediocrity going strong. I decided to pack up again and fish one last area that I had seen near Blacks Fish Camp - a backwater area with lots of vegetation. If only this fish was a little bigger! I got to the area, pulled off the dirt road (which was littered with cans) and dropped my yak in the water. The backwater was small and I was able to fish it pretty thoroughly in about 15 minutes, but it was fruitless. I packed up the yak and spent a few minutes helping a county employee pick up the cans. Knowing I had a very marginal total (34.25"), I figured it might be in danger of a tie. So I headed to the weigh-in knowing that tie-breakers go to the guy who shows up first. Immediately I knew I would struggle to make the top-10, but was hoping I at least placed "in the money". After some tasty BBQ the results were announced. There were 29 day two skunks and it took 28" to make the top 25. They called a bunch of really good anglers to the stage and my heart lept with each place called. Then came #12. #13 has 33.25". #12 was 34.5". My heart sank. Had I forgotten the identifier? Did I leave the mouth open? Did I submit a bad picture? I was fairly sure I had double checked everything, but my heart was now in my throat. The top 3 were announced - Ray Montes took 3rd, Justin Carter took 2nd and Andy Thompson, Sr. took home first prize, $3000, numerous goodies and a lot of glory. Eventually there was a short break in the action, so I crept up front to ask about my photos. Chuck Wrenn, who might be the nicest guy I met all week, was quick to help and realized that they hadn't registered one of my fish. The judges looked at the photos to double check and all agreed that they were both good to go. So, my total was upgraded and I officially finished in 13th place with 34.25". A big thanks to Chuck, Chappy and Chad who were all super helpful and apologetic about the mix-up. I took home a custom rod, a gift card and other goodies for the finish. According to a fellow angler, if I had caught another 1/2" of bass, I would have been in the top 8. Oh what might have been! My finish also qualified me for the KBF Invitational which was being held the next two days at VIP Adventures - private lakes about an hour away. I was a little torn, but decided to enter the Invitational. Tomorrow I will tell that story. 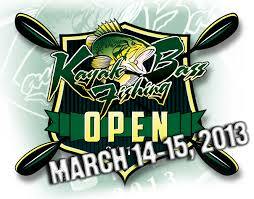 A huge thanks to all of the folks who made the KBF Open possible and big congrats to all of the competitors. 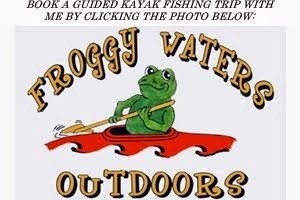 I met so many great people and great anglers and had a blast in the process. Also, a big thanks to all of my sponsors, affiliates and companies whose gear I use on the water. As I mentioned, my Malibu Kayaks Stealth 12 was AWESOME handling tough conditions on that big lake. It was also one of the fastest non-pedal boats out there. And my Carolina Custom Rods paired with Abu Garica reels gave me incredible sensitivity and fighting power to handle those brute bass. As usual, my P-Line performed great, my Columbia PFG gear worked like a charm, my Kokatat PFD kept me safe and my Crack of Dawn Black Diamond paddle was the perfect blend of light weight and power. I was also blown away by the clarity and quality of my new Smith Optics Backdrop Evolve glasses with polarchromic lenses. Good gear can go a long way! Thanks Bill. I have some more details about exactly how I was catching them down there that I wanted to add. But if they have future events on the lake, I would rather keep those tips to myself. That is the sad part of tourney fishing! Sounds like an awesome time. Good luck in the next tournement. Thanks Daniel! It was definitely a lot of fun. Tight lines! Nice read Drew thanks for sharing your experience, I'm glad that you did well and were in the running. Your a excellent angler, sorry you missed out on the brute, but you'll get that one next time. You made a great showing and can be proud of your accomplishments. Thanks Ray. I appreciate all of your kind words - especially coming from another very talented angler. Hopefully I will see you on the water before too long. Tight lines!